For more than 20 years, Ensz & Sons has been offering topnotch home exterior protection solutions in Brooksville, MS and the surrounding areas. As a locally owned and operated company, we see our customers as our neighbors and treat each home as if it were our own. We are committed to giving our clients only the best in sales and service, and this commitment is evident in the results we produce and in the warm recommendations of our customers. Ensz & Sons is proud to be East Central Mississippi’s exclusive dealer for Gutter Helmet®, your ultimate choice in gutter protection. 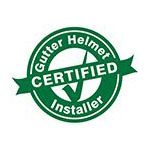 The Gutter Helmet® guarantee is that you’ll Never Clean Your Gutters Again®! More than 30 years of being the #1 gutter guard brand in North America is a strong testament to this promise. Our other product and service offerings include retractable patio awnings, seamless aluminum and copper gutters, and vinyl siding. Outstanding workmanship, attention to detail and customer care are the rule in each of our projects. We believe in the quality of the products we use and stand by all of our warranties. Our service area includes, but is not limited to: Artesia, Brooksville, Caledonia, Carrollton, Columbus, Crawford, Ellisville, Louisville, Macon, New Hope, Pickensville, Reform, Starkville and West Point. Fill out our online form to schedule an in-home assessment with one of our Gutter Helmet® sales representatives or call (800) 824-3772 today to get a free, no-obligation quote. We look forward to serving you.